A May 2016 GOBankingRates survey of more than 4,500 Americans found that over half (56%) have less than $10,000 of retirement savings, and that 28% of those over age 55 have no savings at all. In total, the site determined, about 75% of respondents are behind on saving for retirement. So how much are you supposed to be saving in order to finance 20-30 years post-work? The commonly accepted rule of thumb that you’ll want about 70% of your former annual income (at least) to continue living at or near the style to which you’ve been accustomed. According to T. Rowe Price, that magic number is 15%. 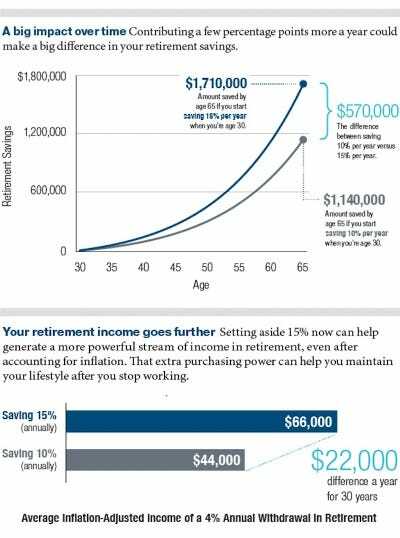 By saving 15% of your pre-tax annual income — including any potential employer match — starting at age 30, you could end up with nearly $600,000 more at age 65 than you would have by saving an already somewhat generous 10% of your income. These calculations are based on a $50,000 starting salary at age 30, with a 3% annual raise and 3% inflation. They assume a 7% rate of return (although investment returns can never be guaranteed) and a 4% annual withdrawal rate in retirement, a somewhat-contested rule of thumb. The growth is largely due to compound interest, which is essentially the interest you earn earning interest on itself (and compounding, get it?). Because of how drastically compound interest affects retirement savings, money socked away earlier rather than later has a disproportionate effect on the ultimate earnings. It’s probably worth keeping in mind that the brokerage making these calculations does offer IRAs and therefore can benefit from your choosing a higher savings rate — but then again, so do you, no matter who holds your savings. It’s a win-win. One nice thing about T. Rowe Price’s recommendation is that it assumes you won’t start contributing this 15% until age 30. That gives most 20-somethings at least five working years, if not more, to ramp up contributions to the admittedly ambitious level. Self-made millionaire and author David Bach saves a whopping 20% annually, but he started in his 20s with just 1%, increased it to 3%, and worked his way up from there.